Everett Rogers is credited with the seminal text book on adoption, The Diffusion of Innovations. It is required reading for anyone who is interested in how new ideas become integrated into the fabric of life’s activities. I read this text back in the mid 90’s when we started working in telehealth and it influenced my view of adoption. Understanding adoption is an important skill because it enables us to predict the future to some degree; it is a useful tool in developing strategy from pilot to scale; and perhaps most importantly, it enables patience during those times when the thing to do is so obvious to you and no one else seems to get it. As I’ve traveled the road of adoption for connected health for two decades, I’ve paid attention to the major sign posts — defining moments when the dialogue changes in such a way that the whole organizational strategy changes with it. I’m also privileged to work at an organization that is generally ahead of the adoption curve as it pertains to connected health, so writing about these sign posts should enable others to take advantage of them in corresponding environments around the world. 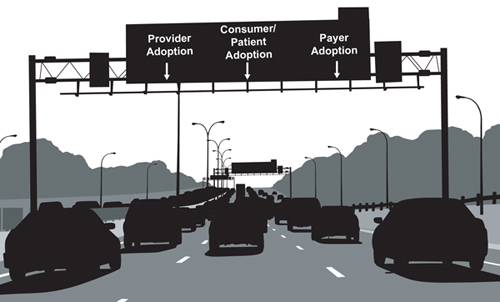 I generally think of the adoption road as a three lane highway (bear with me lest the analogy gets tortured), with the lanes being provider adoption, consumer/patient adoption and payer adoption. Consumers/patients are by far the easiest group to adopt connected health as a model of care. They thrive on the self-empowerment and convenience. Who could argue with improved access to your provider, less travel to the doctor’s office, more flexibility, etc.? The main barriers with consumers/patients are ease-of-use of technology, out-of-pocket costs and privacy/accountability concerns. Providers take their fiduciary duty to patients quite seriously, so their first concern is about quality. If your innovation changes the way care is delivered, will it risk lapses in quality or possibly result in sub-standard care? This message was loud and clear up until about five years ago. That meant for 15 years, our work was very much focused on gathering the evidence for a model of care delivery supported by connected health. Lots of trials, control groups, papers, P values and the like. I took a page from the pharmaceutical industry and went into any discussion with doctors or nurses armed with reprints from the literature and graphs or charts of evidence from our own system to support each innovation I was promoting. 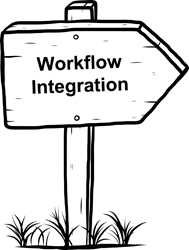 Armed with that input from the front line, we worked diligently on integrating our programs into our core clinical systems (the workflow piece). The reimbursement piece lagged because, though our organization was contemplating sharing risk with our payers, we were really in pilot mode with that type of reimbursement until recently. All we could do was promise our providers that we’d figure out a way to reward them for connected health-driven care, but we could do little more than that. The next sign post came recently when the Centers for Medicare and Medicaid Services (CMS) announced the new CPT code for chronic care management (see also Five Accelerants to the Adoption of Connected Health). This now gives us a framework to make financial calculations about work units, value, etc. We’re currently working with such a reimbursement framework for internal deployment at Partners HealthCare. The final hurdle in provider adoption is capacity. Certain groups of providers are so busy with face-to-face patient interactions (dermatology is one example, which I know firsthand), all of the above criteria could be met and there will still be little adoption. This is a supply and demand problem. Since I trained in the mid 80’s, the demand for dermatology has been on a logarithmic growth curve and the supply has increased linearly. Thus, even with image sharing by iPhones, etc, we have little adoption of teledermatology. In a market with tight supply, suppliers have the upper hand. The sign post I past most recently triggered my idea for this post. As Partners HealthCare has taken on more risk (we are a pioneer ACO with about 500,000 lives at risk, have risk-bearing contracts with all local payers and self insure for our 60,000 or so employees), we’ve started looking at how we might incorporate connected health into the fabric of care delivery. The reverse psychology here is that when payers only pay for face-to-face care, there is no financial incentive to adopt connected health. When we take on risk payments centrally and are rewarded for keeping people healthy, the face-to-face barrier is removed. For the better part of the last three years, we’ve looked at the cost of connected health deployments and spent lots of time on ROI analyses, all for an executive team that are healthy skeptics. Our rigor at this level makes for good fiscal discipline and has forced us to innovate on the supply/operations side. None of that is a bad thing. But in two recent meetings, two different senior executives said something that made my ears perk up. Both suggested that connected health as part of the care delivery process is inevitable. The follow-on comment, in both discussions, was that we had better get as much experience as we can, as fast as we can, so that we don’t get left behind. That is an amazing leap of faith. It says we’ll get the ROIs right, but we should work on experience and deployment so that we stay ahead of that adoption curve. That is an impetus for a real change in strategy at Partners Connected Health. Could I have imagined this day twenty years ago? Well, actually yes — or else I would not have undertaken my commitment to connected health with such zeal. What I didn’t appreciate back then was that it would take twenty years. Good thing or I might have moved on to something with more short term gratification. However, understanding Rogers’ book and theory helped give me the patience to continue to move forward and watch for the sign posts. The Mass General person who said, “We get it, Joe. These programs work, Now figure out how to get it into our work flow and get us paid.” hit the nail on the head with a 10# sledgehammer. There must be a general awareness among providers that the old examine, diagnose, provide Rx’s and say I’ll see you in three months doesn’t quite cut the mustard. That might be fine for a healthy individual with a minor health issue such as a cold, the flu, a skin rash, a cough, et al but for a person with a chronic condition that requires close monitoring that just doesn’t cut it. People with CHF, Diabetes, CKD, emphysema, severe allergies, bronchiectasis, hypertension, et al can have incidents requiring hospital admission or re-admission, strokes, heart attacks which could have been prevented if the provider were aware of patient changes in BP, Heart Rate, Temp, breathing, balance problems and falls, dizziness, med side effects, blood sugar, syncope, blurred vision, etc. There is no way that the provider is going to know about these changes UNLESS the patient provides them or has to report to an emergency room which is ex post facto.There is a similarity between a patient with a chronic condition and a pilot trying to land his/her plane with limited or zero visibility. In the case of the pilot the controller gets the pilot on a glide path to the runway and in near real time monitors the aircraft’s progress giving correctional instructions as needed to keep the plane on the glide path to the runway. A patient with a chronic condition has a desired “glide path” baseline(BP, pulse, temp, weight, blood sugar, sodium intake, nocturia, edema, pain level SOB ,etc. etc) that hopefully keeps the chronic condition under control’ since it is unlikely to be curable. Once that is established it is the patient’s responsibility to try to stay on the “glide path” by regular reporting of the baseline parameters to the provider. Here is where the system falls apart because normally the provider only sees the patient once every three months or so. (Medicare and insurance won’t pay for weekly or monthly visits and changes in a chronic condition can change in minutes or hours!!! )How many providers tell the patient to report the baseline critical stats regularly. As a 91 year old I have never had that happen!!! I have made some progress with my nephrologists by regularly reporting my BP, heart rate, weight, side effects, edema ( I took a cell phone photo of my ankle edema and emailed it to her.) etc. I was having some difficult controlling the BP and she added Toprol which has stabilized my BP’s. I can’t email her because of “privacy issues” and can’t send a My Chart message to multiple addressees(i.e. Nepthrologist, PCP, Cardiologist), you can’t attach anything(i.e. photos of skin rashes, bruises, edema, reports, articles about Connected Health. Consequently it has limited value and is used accordingly. My nephrologist’s nurse reads the My Chart messages, reports to the doctor and she has the nurse respond with her answer. Takes very little time but can pay big dividends!!!! If the insurance companies would encourage and pay for Connected Health communications the improved outcomes would save them money. It could be a win win win for the patient , provider and the insurer. It will never happen though in all probability, makes too much sense. thanks for this thoughtful and comprehensive analysis.